This post is dedicated to sharing examples of other websites that look good and features you think the website should have. It would be appreciated that you post a link (at the very least) to a website that you like or has the feature that you are suggesting. Also when you post provide a little explanation about why you like the website or think the feature should be added. We will consider all ideas posted, and integrate what we feel best works for NANFA's website. The Following was originally posted By Erica Lyons as a good example of a website that contained forum updates. That is a fairly nice website. Kind of POPS more than ours, and draws you in. I kind of like the "latest posts in forums" Idea. Many of our members do not use the forum. This might act as an introduction, or at least keep them a bit in the loop. The website is one of the only I've seen that hasn't incorporated top-bar navigation instead of side-bar. I mentioned this before. But I'd like to see another tab/page for Web Outreach/Social NANFA with links to our Youtube, Facebook, Google+ pages....we're not on twitter yet. I would also like to see links to the social media. It would also make a good first impression to have a slideshow of fish instead of a stationary tangerine darter on black. In the slideshow could also be news and grants. Most sites have a banner at the top, I think that would make a good impression. I definitely agree with both of those comments. One of those snazzy "back to the top" tabs would be nice. I have a hard time with the edit toggle switch thingy. I've dumped a few posts by accident trying to add smilies or even going for paragraph breaks. Really frustrating as I'm a laborious typer, a long post takes a lot of effort. It may be just me not getting it, or maybe a feature I can turn off, not sure. I also wish it wouldn't let type out a long message when your not actually logged in. I dumped a couple posts trying to get logged in after typing. Just little things but never ran into them elsewhere. A com box so members can openly chat in real time. There's no forum here for talk other than fish, and having a chat box would help people get to know each other a little better. 120 low tech native planted - Blackstriped Topminnow, Central Stoneroller, Fathead minnow, Golden Shiner, Black chin shiner, Carmine Shiner, Emerald Shiner, Sand Shiner, Spotfin Shiner, Orangethroat darter, Johnny Darter, and Banded Darter. Ok, so I've been thinking. Always a dangerous thing, I know! While we do have some educational material on the website, mostly authored by Chris, the overwhelming feel of the site is that of a club newsletter. If somebody is wanting to get into natives, or maybe they have a passing interest, then there is all this club stuff, and then down near the bottom we see "biology and captive care". NANFA's primary content outlets have always been the mail list/forum, and A/C. The latter is no help if you are not already a member. So I propose that we change the focus of the website entirely, so that it is THE go-to site for info on natives. I am willing to do some of the writing. If anybody feels this is a good direction to take, that is. I cannot commit to redesigning the whole website, or changing its focus as you suggest. At least not in one grand sweep. But I can help you get more content on the webpage if you generate it. I agree with your basic idea that we need to have more info up there. I was (and am still somewhat) pushing FIF as one way to do that, cause I like fish. But if you generate other content I am happy to put it up for you and even generate a new section of you get enough content (or restructure some if that helps). Michael - not FIF, but content that the native curious would find helpful. 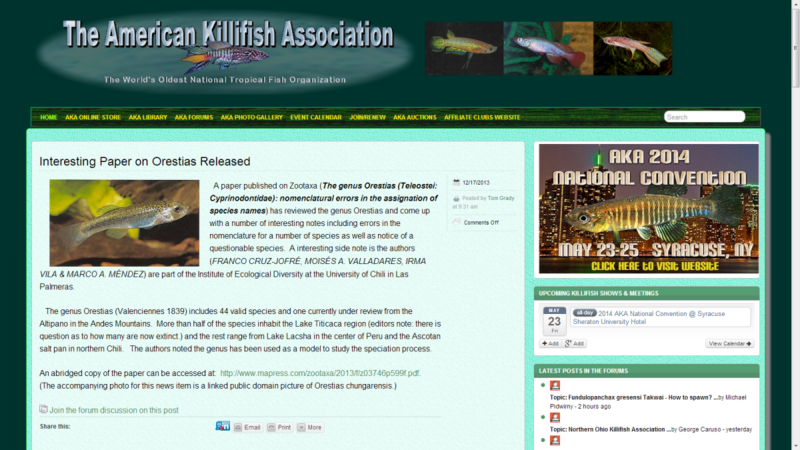 I realize that we all are volunteers and have lives outside of NANFA, but after talking to some well-known fish personalities, I think that the focus of the website is all wrong. Anyway, I'll write some content and hopefully Chris or somebody will be willing to edit it, and then we'll see. I could be blowing smoke out of my caudal fin. One of the things I want to do is present different articles on how people can enjoy natives, other than capturing them. I would prevail upon you and Casper to present a good argument for snorkeling. The why's and wherefores. Microfishing, underwater photography, et al., should be represented as well. The whole gamut of the native fish experience. I say this, because most of this stuff is represented in A/C. Which is not available to the native fish curious, as opposed to the confirmed acolytes. But as long as I am on the subject, should we not post select articles from A/C to the website, as teasers (as it were)? A table of contents for each issue (with abstracts), and a couple of articles to whet their appetites. Just thinking out loud.